Ribbit Zibit is a frog conservation exhibit that incorporates living animals & plants inside the Leonard Wilkening Children’s Gallery. Guests can get eye-to-eye with Red-eyed Tree Frogs, leer at the Lemur Tree Frogs, and peer into the Panamanian Golden Frogs habitat. 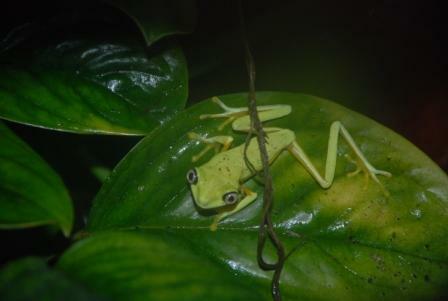 The Poison Dart Frogs are well represented in colors of yellow & black, blue & black, and green & black. There is also a separate window to watch the world of tadpoles as they begin their transformation. With several large, eye-catching interpretive displays within the exhibit, visitors can read interesting facts about each species and learn about the global crisis in amphibian survival. The exhibit not only showcases these unique, colorful amphibians, it also teaches and inspires guests about one of the greatest and most urgent conservation undertakings ever: the preservation of frogs and amphibians. Why do frogs matter? They are an important part of a healthy environment. They control pest insect populations that damage agriculture and spread diseases. These amazing creatures are sentinel animals and are among the first species to be impacted by contaminants in the environment. Some frog species have been used with great success in the advancements of medicine to help heal the sick. 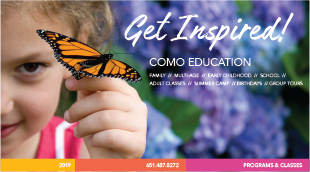 Como’s mission is to inspire our public to value the presence of living things in our lives, and a main value is educating on conservation. Click on the “Frog Conservation” tab above to learn more about Como’s conservation efforts. Experts say nearly half of all the world’s more than 6,000 species of amphibians are threatened with extinction due to habitat loss, climate change, pollution and pesticides, introduced species, wild animal collection and most urgently, a parasitic fungus called amphibian chytrid, a deadly disease that is rapidly eradicating amphibian species throughout the planet. This represents the greatest species conservation challenge in our history. Panamanian Golden Frog – Due to the global amphibian crisis, Como staff is participating in the management and husbandry of five species of frogs endemic to the Central American country of Panama as part of the Chytrid Fungus Recover Plan. Zookeepers at Como Zoo have successfully bred Panamanian Golden Frogs, Lemur Tree Frogs and Glass Frogs. Some of the resulting offspring have been donated to other AZA institutions. Poison Dart Frogs – Poison dart frogs, also called poison arrow frogs, are so named because some Amerindian tribes have used their secretions to poison their darts. These frogs are found in Colombia along the western slopes of the Andes. In 1999 a Zoo pathologist published his discovery of a then-mysterious infection that was afflicting and eventually killing poison arrow frogs and white’s tree frogs. Through his effort, cutaneous chytridiomycosis was documented for the first time as a vertebrate parasite. The veterinarians along with keepers and pathologists also developed a treatment for the chytrids. Como Zoo has been working on conservation and breeding programs for the Poison Dart Frog, along with the treatment of this parasite. Tropical Tree Frog – Due to habitat loss, these small creatures are running the risk of becoming extinct. These animals are the most important part of our ecosystem. For example, they consume large quantities of insects and other prey, and in turn they are consumed by other animals, in endless food webs of rainforests. Just because they are such vital chains in the ecosystems they belong to, and due to their overall sensitivity, frogs are considered an indicator species – the species that can act show environmental change or the change in an ecosystem’s health. The “indication” for us humans to note here is that such environmental change affecting the tropical frogs can also affect many other species of animals including ourselves. Wyoming Toad – Como Zoo has paired up with the US Fish and Wildlife Service (USFWS) to assist with the Wyoming Toad Recovery Project. Wyoming toads are listed as endangered. In 1996, the USFWS partnered with the Association of Zoos and Aquariums (AZA) to develop a captive-breeding program as well as to reclaim toad habitats. Since then, thousands of tadpoles have been released into protected areas. Although the population seems to be increasing, the USFWS has not been able to systematically monitor the release sites to determine the success of the project. But this changed in 2008. 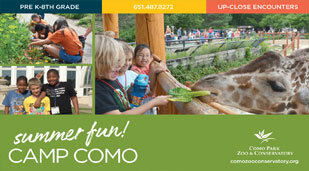 Como Zoo has been part of a team visiting Laramie to join the USFWS and other AZA zoos to conduct surveys. Using GPS units, volunteers set up transects (a designated piece of land) around Lake Mortenson and began to look for toads. In each transect, they were given an allotted period of time to look for toads. When a toad was found, volunteers took its photo, and then measured, swabbed for chytrid, weighed, sexed and tagged it. Tagging is the placement of a microchip, just like the ones used in pet cats and dogs. By tagging a toad, it can be determined if this was an animal that was caught before. If it was, a history of the animal can be developed. Volunteers also took an assessment of the environmental conditions, such as the wind, sun and what type of vegetation the toads were found.